To play Zezenia you must first create an account. On your account page you will create your character by choosing a name, the game world, and character class. Please make sure to choose a name that does not violate the Game Rules. Violation may result in a warning and name-lock or in extreme cases a game ban. Next you will need to download the client. There are a few options available here: Download Client. Once installed simply open the client, enter your account information, and choose your character to login! Below is the main Zezenia Screen which is heavily modifiable. 1 Game Window The game window is where everything takes place! Many of the in-game windows may be moved and/or re-sized using left-click and drag. 2 Minimap Shows your current location in the Zezenia World. Expand your map and fill in the unknown areas by exploring! You may zoom in and out using the (+) and (-) buttons. It is possible to move by left clicking on the mini-map but distance is limited. You can also open a larger map by pressing the 'large' button. 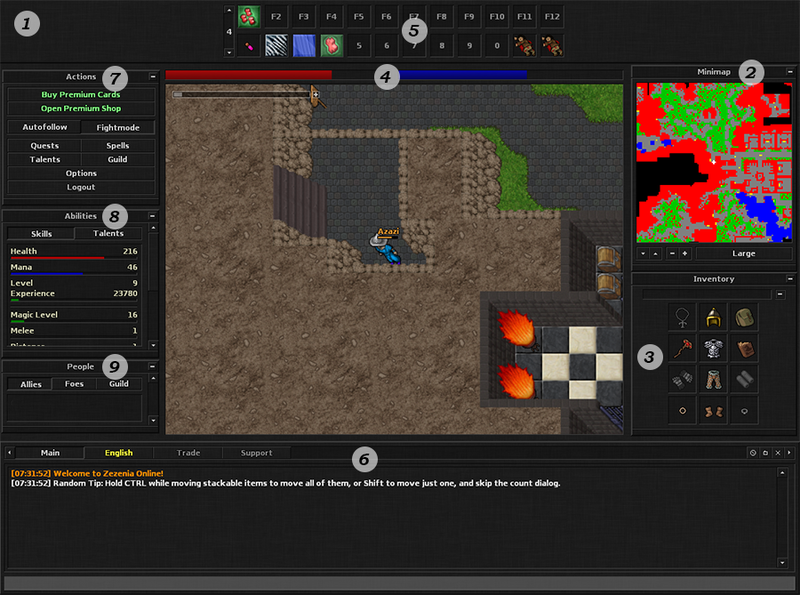 In the new window you can set map markers by right-clicking and 'add marker'. Once a marker is placed it will then appear in the basic minimap as well. 3 Inventory Items may only be placed in the appropriate space or body part and some items are class specific such as shields, bows, wands. Items may be moved by left-click dragging only. Your current battle, blessing, and skull status will appear here as well. 4 Status Bars Here you may see your current Health and Mana points. It is possible to move the location of these bars by openening the 'options' button under (7) Actions Window. 5 Action Spell Bar This is where you will assign your spell and action keys. To place a spell or action right click on the space you wish to assign and choose the spell or action in the new window. You may use keys 1-0 while in Fight Mode or F1-F12 at all times. Also, all keys may be used anytime with a left-click. M1 and M2 are assigned to mouse buttons if you have a compatible mouse with basic buttons. 6 Chat Window Here you can talk to NPC's and chat with other players in public or private channels. In the top right of this window are the ignore list, open new channel, and close chat tab buttons. 7 Actions Window Find access to game options menu, quest log, talent window, premium shop, and other game features. 8 Abilities Window See your health, mana, experience, and all skill levels here. 9 People Window Save your friends under Allies or enemys under Foes by right clicking in window and adding their name. The guild list is populated automatically, showing online members.